Girly-girl is not a word anyone would use to describe me. I was a proud tomboy throughout childhood – avidly playing four-square and basketball with the boys before school and during recess well after other girls had turned to giggling over boys and sharing celeb gossip. In high school I was a jock, going from sport to sport, season to season. Throughout college, grass stains streaked my clothes and bags, and dirt was often caked under my nails from hours spent on Ultimate Frisbee fields. Sitting around and gossiping about boys, clothes, and makeup was never my thing. I was so bent on not being a girly-girl that I despised the color pink well into my twenties, just on principle. To this day, I hate!! shopping. And yet….there is one very girly activity I’ve long secretly indulged in….. There, I said it. I prefer to be barefoot (or in open-toed sandals) whenever possible, and cute painted toes are my not-so-secret indulgence. About 10 years ago, I discovered nail art. 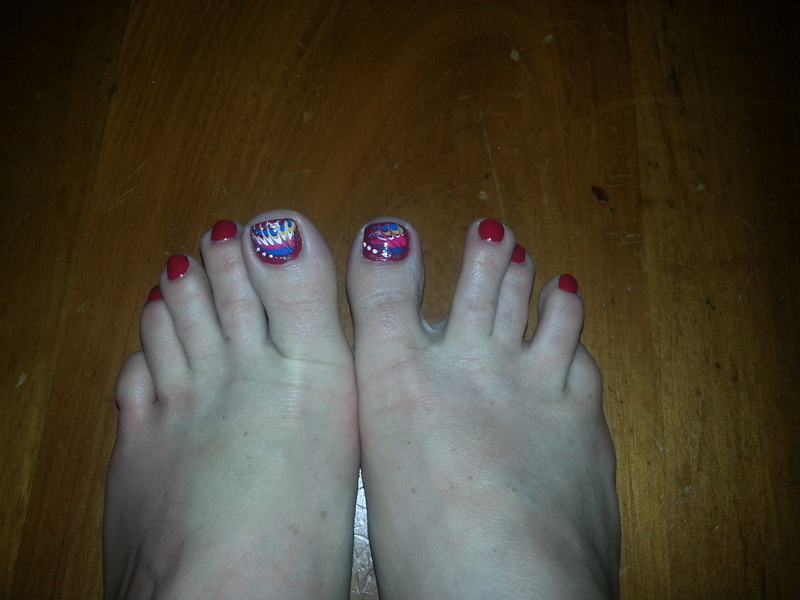 Since then, it’s rare that you won’t find some fun design on my toes. Yes, it’s a guilty indulgence. But having a little bit of art on my feet just makes me smile. It’s an instant pick-me-up. And heaven knows, we all can use those! You don’t have to take my word for it. Gretchen Rubin, author of The Happiness Project, agrees that little treats like this play an important role in our maintaining well-being. 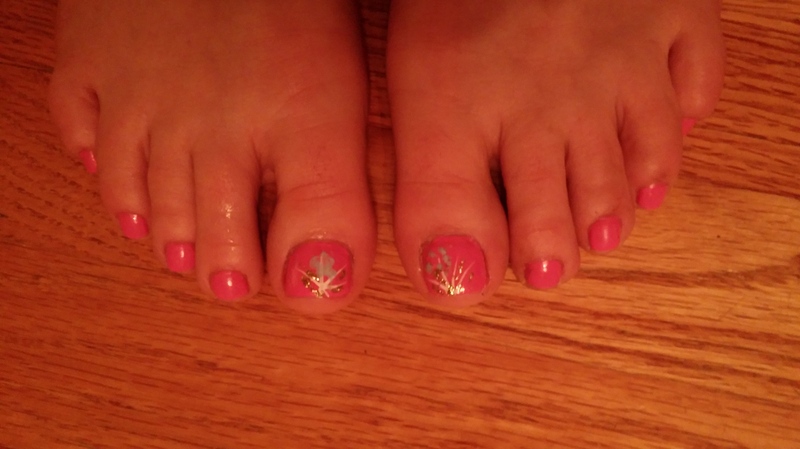 I always leave the design up to whomever is doing my pedicure (I am nowhere near skilled enough to paint my own toenails nicely, let alone paint designs on them!). I find I get a wider variety of fun designs that way, too. Some I like; some I don’t. Regardless, I always know that 4-6 weeks later I’ll have brand new art to make me smile. Lately, I’ve been asking the pedicurists to give me something that will make my girls say “oooh mommy!” when they see my feet. But let’s be real, while I do love!! their reactions, I do this for me. I plan to keep putting art on my toes as long as it makes me smile. And if that makes me a girly-girl, I can live with that. What secret (or not-so-secret) indulgences do you allow yourself that make you smile?